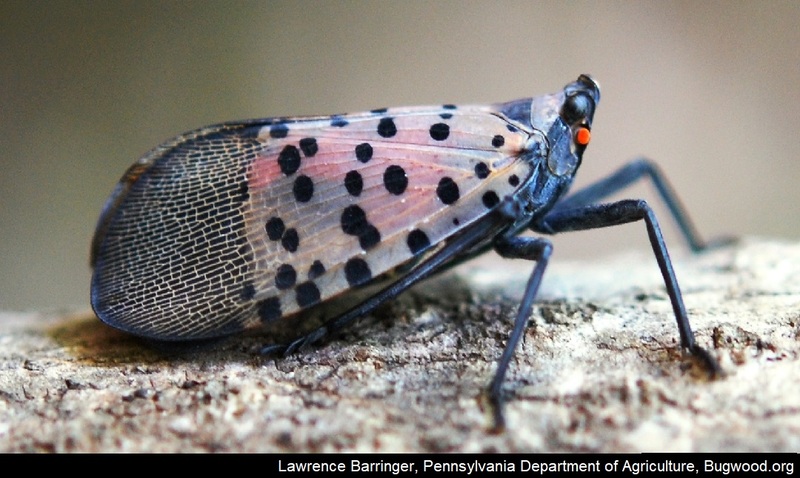 Spotted lanternfly (Lycorma delicatula) is an invasive planthopper that was first confirmed in the United States in Pennsylvania; and as of October 2018, was confirmed in several Mid-Atlantic states including thirteen Pennsylvania counties. Spotted lanternfly is a native to northern China. This insect is found throughout China, Vietnam, India, Japan, Taiwan and South Korea where it is considered to be a major pest. 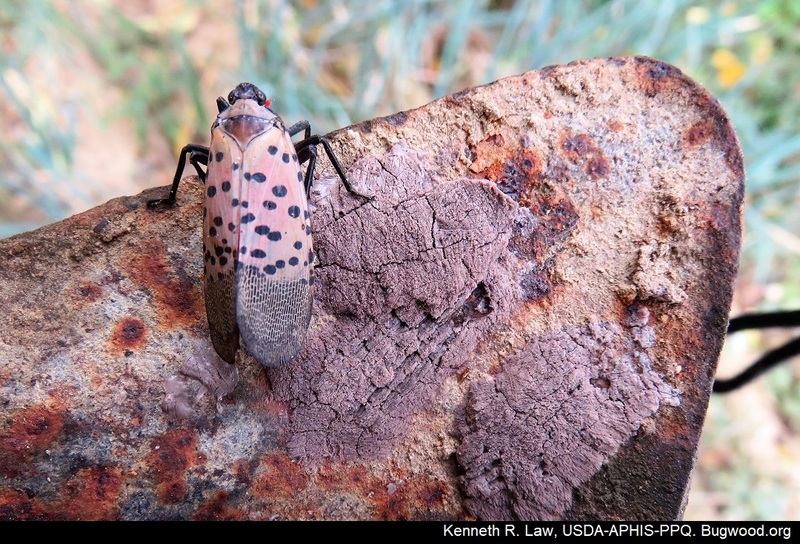 The spread of this insect could seriously impact grape, tree fruit, tree nursery and logging industries in the U.S.
Link - Where is Spotted Lanternfly Found in the United States? 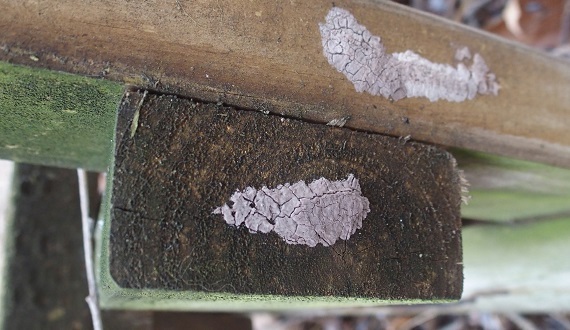 The damage caused by spotted lanternfly is from the feeding activity of the adult and nymph stages of the insect. These pests have ‘piercing-sucking’ mouth parts and feed on the vascular tissue of young shoots, leaves, petioles, branches and trunks of the host plant. 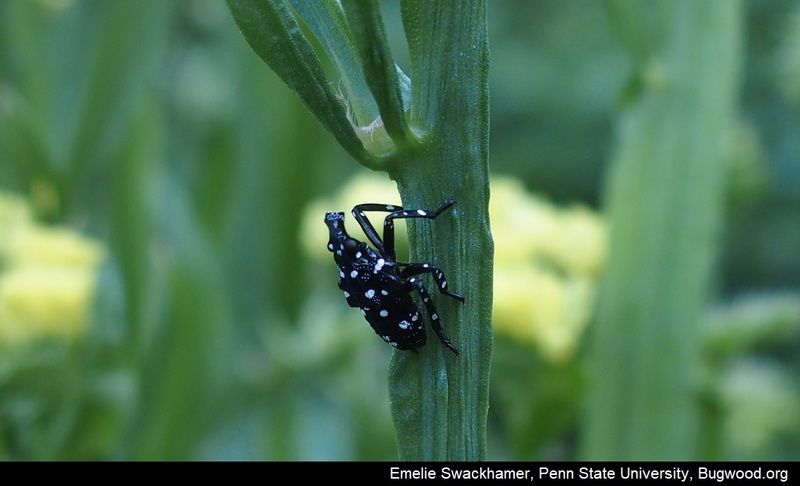 To say the least, spotted lanternfly could be a potential pest concern for over 100 woody plant species. 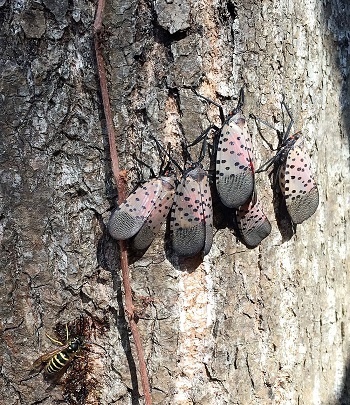 Adult insects and nymphs of spotted lanternfly typically feed in large groups causing oozing wounds on woody trees and shrubs, and can cause wilting and death of branches. Large groups of this pest produce ‘honeydew’ which is actually a waste product from the insect’s feeding. The large amounts of honeydew attract other insects and promote the development of sooty mold on the surfaces of the leaves and branches, which can give the tree a black fuzzy appearance, and further reduce the plant’s resources by blocking sunlight for photosynthesis. 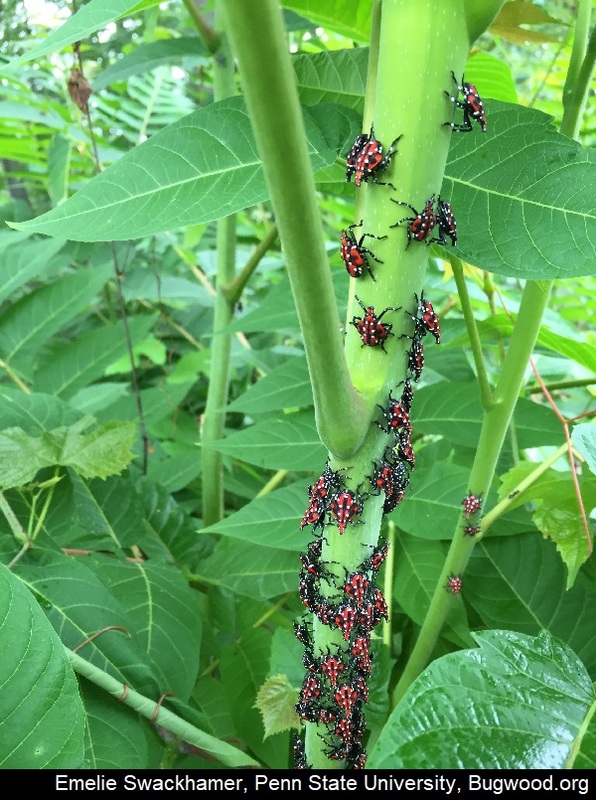 The stress incurred from spotted lanternfly can predispose the plant to other pests and pathogens. Infested trees can show significant deposits of honeydew and sooty mold, both in the tree and objects on the ground, to the point where the base and surrounding areas appear black. The tree of heaven is the preferred host for egg laying adults of spotted lanternfly; however, there are many preferred plant hosts including: grapevine, hops, Virginia creeper, Amur cork tree, Chinese mahogany, Korean evodia or bee bee tree, red maple, sugar maple, birch, chinaberry, snowbell, oak, pine and willow to name a few. 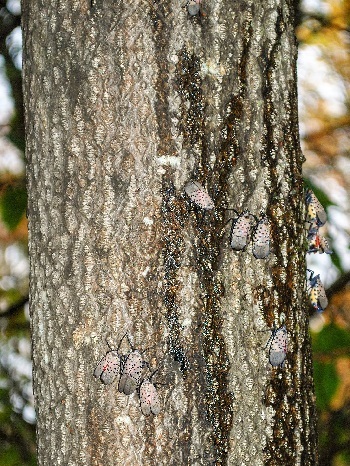 Spotted lanternfly may also occur on species of Prunus such as cherry, plum, peach, and nectarine; as well as additional host such as apple, lilac, tulip popular, American beech, American sycamore, walnut, and rose. 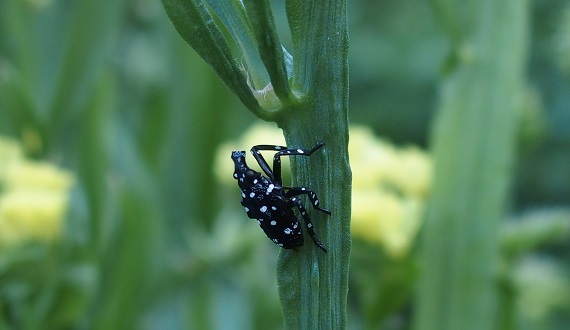 Fortunately this pest is rarely found on annual or perennial herbaceous plants. 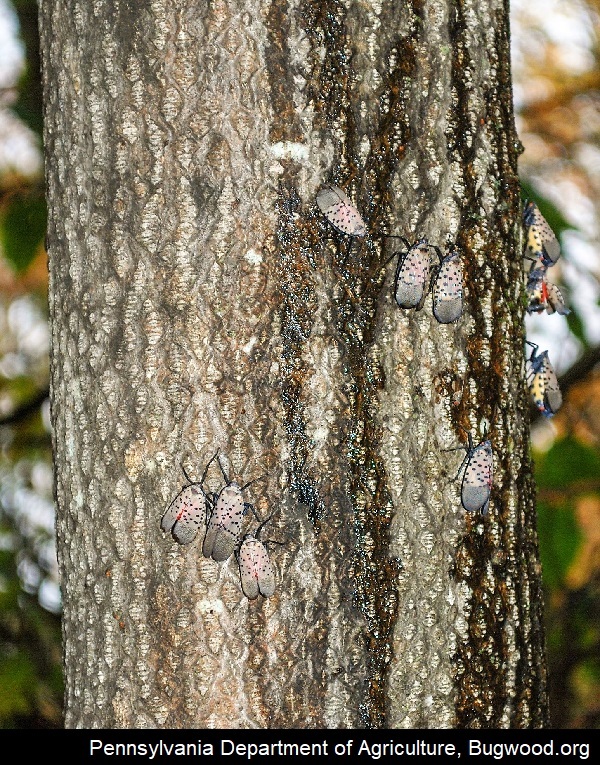 Spotted lanternfly are known to migrate up and down the tree and tend to cluster at the base of the tree during the day or in the tree’s canopy if there is adequate cover. They are easiest to spot at dusk when they are the most active and on the move. 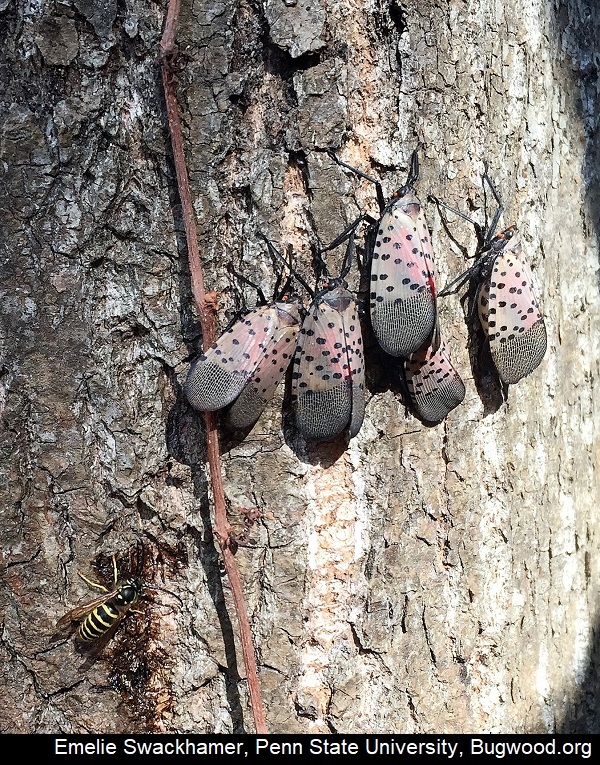 The eggs of spotted lanternfly overwinter on the bark of trees, and may also occur on any physical object such as firewood, rocks, outdoor furniture, equipment or vehicles parked outside. Since this pest is indiscriminant as to where they lay their eggs, there is a risk of moving this pest by human activities to any new place where infested articles are moved. The greatest risk of accidentally moving this pest is from late September through hard frost, when the egg laying season is the most active. Nymphs emerge from the egg masses in late April to mid-May and will climb up trees to begin feeding in small groups. Adults become noticeable early to mid-July. 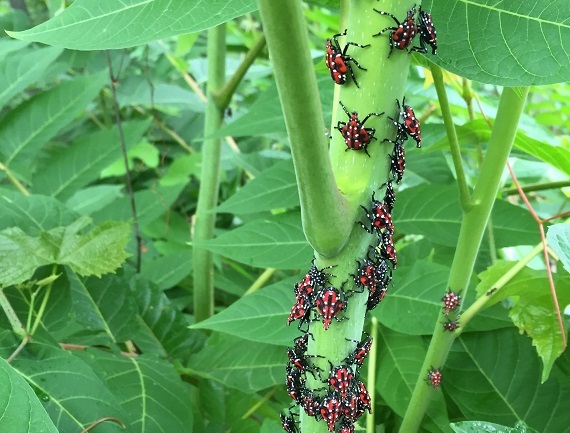 Feeding groups of spotted lanternfly are likely to dislodge and drop to the ground or fly if disturbed, and sometimes these numbers can be in the thousands when a pest outbreak occurs. 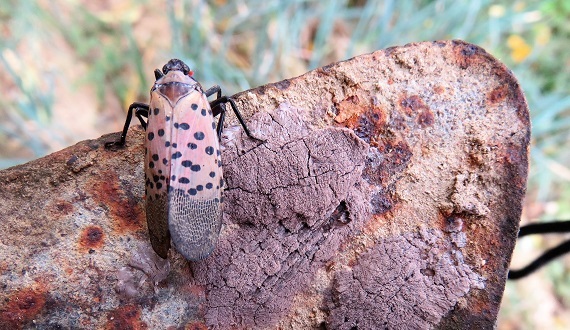 Adult spotted lanternfly are approximately 1 inch long and one-half inch wide with visually striking wings. Forewings are light brown in color with black spots near the body and a speckled band near the end. Hind wings are scarlet with black spots near the body, have white bands near the center, and have a black net-like pattern at the end. The abdomen of this insect is yellow with black bars. Nymphs in their early stages of development appear black with white spots and turn to a red phase before becoming adults. 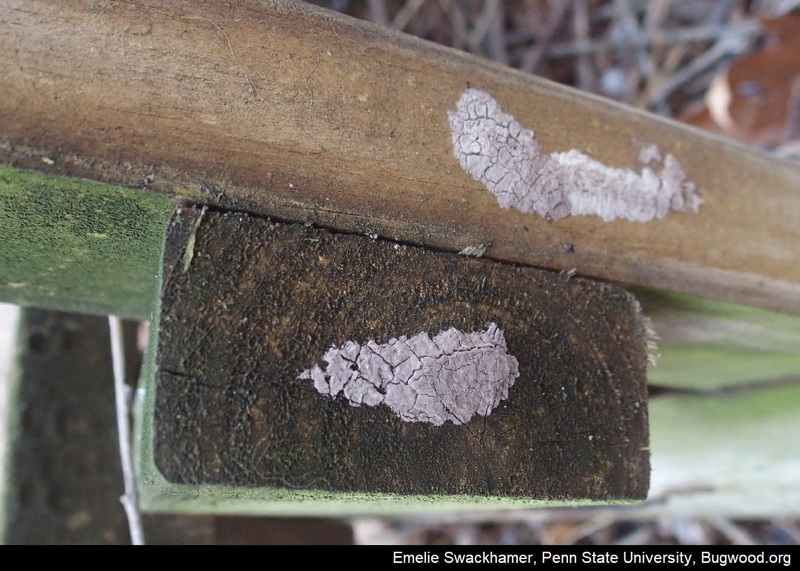 Egg masses are yellowish-brown in color, covered with a gray, waxy coating prior to hatching. 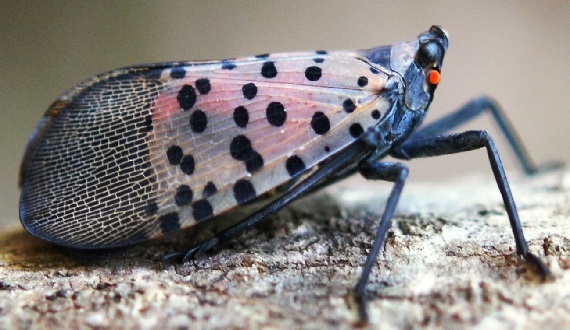 The spotted lanternfly is not known to occur in Iowa. If you suspect it as a new introduction to Iowa, please let us know by going to our Contact us page. We would be interested in taking a closer look. Early detection is vital to eradicate or control this pest from spreading to new areas.